2016 "Wedding's off. Party's on." Katie Walsh It's a fascinating depiction of the way men do -- or don't -- confront life's tragedies and traumas. Christy Lemire You probably wouldn't want to spend that much time with these people yourself, but at least they're never boring. 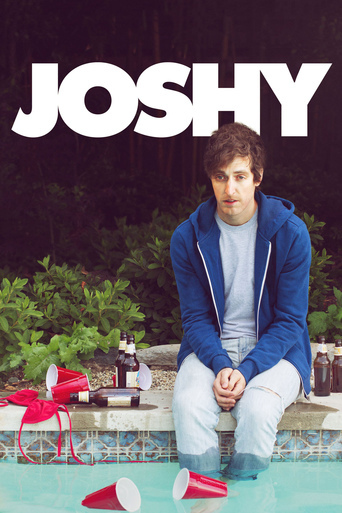 Adam Graham "Joshy" is like a weekend with random friends: fun and familiar, but rarely any deeper than the personalities involved. Don't look for more and you'll be fine. Glenn Kenny Alcohol-induced shambling, cocaine-induced motor-mouthing and mushroom-induced melancholia are depicted with sobering accuracy. Devan Coggan Baena delivers a quiet and largely plotless dramedy that walks the line between goofy bro comedy and mumblecore drama. Cary Darling An engagingly perceptive and often darkly funny glimpse at wrestling with issues of adulthood after a life of seemingly endless adolescence. Jesse Hassenger Joshy uses so much architecture from indie-movie blueprints and uses so many comic actors as building blocks that it briefly seems like an elaborate spoof project. Abbey Bender Joshy isn't fun. It doesn't want to be. It's far more focused on the moment when fun becomes discomfort. Kyle Smith "Joshy" fairly accurately captures the way guys at play mock and tease each other while avoiding seriousness at all costs, and Baena additionally manages to give each character enough space to make a mark on his own.